IT JUST CONTINUES, MY OH MY!!! Pinch runner Hiram Bocachica on 2nd. Ground ball to Mark Loretta at 2nd, but Edgar gets on safely. Bocachica is rounding 3rd and all of a sudden, he falls down. 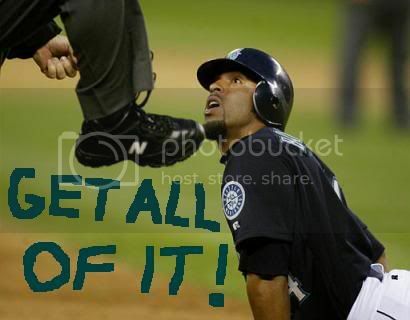 I don't need to go to a comedy club, I get my laughter from the 2004 Seattle Mariners. That's all you can do at this point. Just laugh at this trainwreck of a ballclub. I'm sorry, Freddy. Go explore the studio space. Really explore the studio space.